What a weekend to pick! Actually, the scary thing is that the damage is described as worse than Katrina. But in reality she "blew through" Jackson having already mortally scarred the coast. These were direct strikes by mother nature to Central Mississippi. 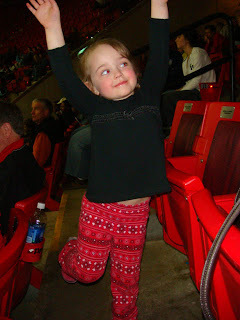 I had to post the pic of her at right doing "cheerleader hands" at the NCAA Women's Basketball 1st & 2nd Rounds. What a cutie. Sunday was church, lunch with Poppy & Grammy, nap, and picking up Mommy from the airport. Wow, Georgia's growing up so fast. 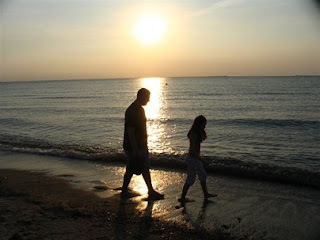 Seems kinda silly to say since she'll be 4 end of July...but then there was a time I couldn't imagine a child in our life. Now, I couldn't imagine life without her. Kim just sent me the link to your blog...which I never could remember how to get into it but now I've earmarked it.